The Best Birmingham Blogs from thousands of Birmingham blogs in our index using search and social metrics. We’ve carefully selected these websites because they are actively working to educate, inspire, and empower their readers with frequent updates and high-quality information. Also check out Top Birmingham Youtube Channels list for Top videos on Birmingham. Birmingham, UK About Blog Birmingham Live is all about Birmingham and everything you're talking about right now. Round the clock news, sport, weather and traffic updates for the Second City. Stay up to date with latest Birmingham news, sport, weather and events. Facebook fans 316,886. Twitter followers 283,340. Birmingham, UK About Blog Birmingham Post provides users with news, investigations and interviews, credible business information, the latest on executive property, career opportunities and reviews on the region’s culture. Facebook fans 55,599. Twitter followers 119,271. Birmingham, England About Blog Independent Birmingham is dedicated to unearthing the very best of Birmingham’s hidden gems and best-kept secrets, touring the city in search of the unique and the inspiring. Facebook fans 28,701. Twitter followers 41,821. Birmingham About Blog The home for everything stylish in Birmingham. From fashion and beauty to the best things to eat, see and do, Style Birmingham has you covered. Facebook fans 8,618. Twitter followers 7,468. Digbeth, Birmingham, UK About Blog The Custard Factory is Birmingham's Creative Quarter. Find out about cool events, movies, cafes, independent shopping, and offices in Birmingham's iconic Creative Quarter here in Digbeth! Facebook fans 41,621. Twitter followers 46,847. Birmingham, United Kingdom About Blog Birmingham Living is the region's premier lifestyle magazine. It is an editorially rich magazine that aims to inspire Brummies, to inject a bit of swagger and encourage people to fully engage with the wonderful opportunities available throughout the region. Facebook fans 1,182. Twitter followers 3,770. San Francisco, CA About Blog A subreddit with articles and discussions on Birmingham, UK from the Reddit community. Facebook fans 1,187,611. Twitter followers 557,021. Coventry, West Midlands About Blog Vanity Claire is a style blog ran by Midlands-based fashion and beauty blogger, Claire Cavanagh. Facebook fans 819. Twitter followers 5,309. Birmingham, UK About Blog Award winning parenting blog. Not only charting the highs of being a Mum but also talking about the lows. From tantrums, to starting school. From rows with your other half, to the never ending guilt. All covered with humour. Facebook fans 30,624. Twitter followers 23,147. Birmingham About Blog A Birmingham, UK based fashion, beauty, lifestyle and travel blog. Facebook fans 1,458. Twitter followers 3,258. Birmingham, UK About Blog Hi, I’m Natalie. Mum in Brum is an award-winning UK parenting and lifestyle blog inspired by a modern family living. Apart from recording my journey (and challenges!) as a mum, I also blog about our lives as a modern family, our travel adventures and my passion for interiors. Facebook fans 1,212. Twitter followers 8,936. Birmingham, West Midlands About Blog Brum Notes Magazine is a monthly magazine covering music, culture, lifestyle and what's on in Birmingham and the West Midlands. Facebook fans 4,650. Twitter followers 12,785. Birmingham, UK About Blog 30 something UK based lifestyle blogger with a love of beauty, fashion, food, and travel. I also co-run the Birmingham Bloggers UK network; arranging events, meetups and doing blogger outreach. Facebook fans 685. Twitter followers 4,026. Birmingham UK About Blog A Birmingham based food and cocktail blog. The aim of the blog is simple; to celebrate the food and drinks scene in the Birmingham-ish area. This blog also includes news; restaurant, bar and product reviews; and the odd recipe here and there. Facebook fans 1,859. Twitter followers 8,324. Birmingham, West Midlands About Blog Emma Victoria Style is a Lifestyle, Food, Hotel & Travel Blog authored by Emma Victoria Stokes. She writes about food and restaurant reviews, create recipes and document her daily life. Facebook fans 754. Twitter followers 4,166. Birmingham, United Kingdom About Blog LoveBrum is a Birmingham Charity that engages with and supports local people and businesses to build an even better Birmingham. Find out what LoveBrum have been up to and the latest news in and around Birmingham and how our causes are fairing with our blog. Facebook fans 11,687. Twitter followers 9,616. West Midlands, England About Blog Hi, welcome to my blog! My name is Kirsty and I am an administrator living in Birmingham, UK. In my spare time I enjoy reading, spending time with my family, boyfriend and friends, all things Disney and Harry Potter. Here you will find a variety of topics which include posts about my personal life, gluten free food and travel etc. Facebook fans 900. Twitter followers 4,056. Birmingham, UK About Blog Everything you need to know about Birmingham - Live, Learn, Work and Play, we have it all here. Facebook fans 1,930. Twitter followers 1,721. Birmingham About Blog Positive Fridays is a Birmingham food blog. Find articles on restaurant reviews, drinks, events and travel. Facebook fans n/a. Twitter followers 2,697. Birmingham, UK About Blog Hi! I'm Chloe, a Birmingham based food blogger, documenting everything edible from fine dining to street food vans, and a healthy dose of cocktails and craft beer. With restaurant reviews, cocktail classes, recipes and a sprinkling of my travel adventures. Facebook fans 239. Twitter followers 2,130. Birmingham, United Kingdom About Blog Digital Birmingham lead on smart city and digital strategy across the region, establishing new connections, partnerships and collaborations that help to accelerate sustainable economic and civic growth. Facebook fans 112. Twitter followers 15,906. Birmingham, UK About Blog My name is Selina, Birmingham Fashion & Beauty Blogger. This blog is a girliest fashion blog. Keep up to date with latest articles from this blog. Facebook fans 607. Twitter followers 3,573. Birmingham, UK About Blog John Tyrrell blogs from Birmingham, England about local, national and international issues. 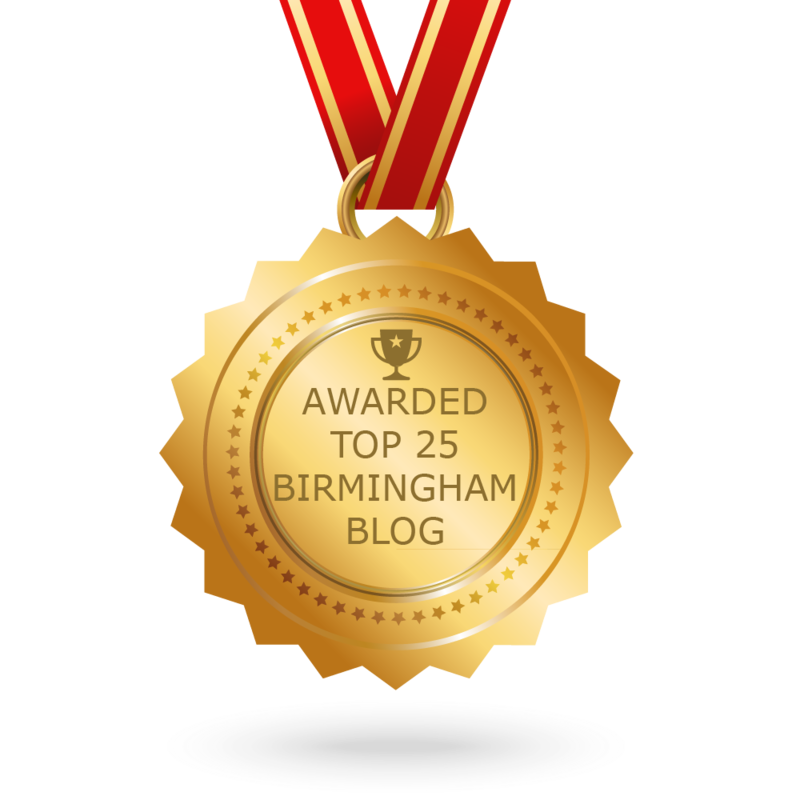 CONGRATULATIONS to every blogger that has made this Top Birmingham Blogs list! This is the most comprehensive list of best Birmingham blogs on the internet and I’m honoured to have you as part of this! I personally give you a high-five and want to thank you for your contribution to this world.